SDP/SI, a leader in comprehensive mechanical solutions for critical motion control applications is pleased to introduce a new line of couplings. SDP/SI's Miniature Fairloc Bellows Couplings are zero backlash, easy to install and corrects for angular and parallel axis misalignment. 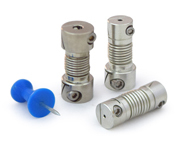 Readily repositioned, the miniature couplings dampen vibration and noise making them a perfect choice for many applications, including medical device manufacturers. Because of its compact design and high-quality build the miniature coupling series "S50FP9(-,M)FB..., is durable and allows connections in restricted spaces. Both inch and metric dimensioned parts are offered and a variety of bore combinations are available, ranging from 1 mm to 3 mm and .0325" to .125". The hubs feature the unique Fairloc design, capable of maintaining shaft alignment when others fail. Miniature Fairloc Bellows Couplings are the newest addition to the extensive coupling line offered by SDP/SI. Both rigid and flexible varieties are available, including modular bellows, beam, disk, jaw, Oldham, and slit types. To assist designers in locating the perfect coupling for an application, SDP/SI has developed a coupling selector tool available at the website.